Picking up on the general disarray in the Brexit debate eureferendum.com wonders whether it is even possible to conduct a well-founded referendum on the EU in this country. The level of knowledge on both sides is so abysmal that an informed debate is almost impossible. This is a hugely pertinent question. It has taken several long months for politicians do gradually work out the functional difference between a customs union and a single market. Even now there are few who could confidently define either and even fewer who could construct arguments to any level of sophistication for or against either. As to the matter of EU law it is a near certainty that few MPs could tell us where it comes from and how it is made. Even basic knowledge of the EU law making process is thin on the ground. That though is forgivable. For instance, a regulation is different to a council regulation which is different to a directive which is different from an ECJ decision. Similarly barely anyone can say the difference between the council and the commission and what the respective roles are and where the overlaps and conflicts are. And this is without going into the vagaries of the Parliament. The more informed remainers can give us a Janet and John recital of how it works in theory but have no more idea how how it functions in practice than any man on the street. even less is known of the massive lobbying apparatus in Brussels and the day to day operations. But then, says EUreferendum, does that not make the case? If the majority – for good or bad – is not able properly to describe their system of government (with some even denying that the EU is part of our government, supreme in the areas of its exclusive competence), how can it possibly be called a democracy if informed debate is central to it? We know roughly how the Westminster system works. We elect governments who propose laws, they fanny around a bit then have a vote then fanny around a bit more, then it gets kicked up to the Lords for a bit more fannying around and finally vote it into law. The processes can sometimes be a little mysterious but we basically know who is responsible for what and at the end of the day if they screw it up too much we can get rid of them. In terms of lobbying we know roughly where to look and our media does actually keep tabs on it, unlike Brussels which has only attracted the media's interest since we voted to leave. There is a level of basic transparency and we get to hear of the more egregious abuses. Not so in Brussels where Monsanto is practically writing the rules and big tobacco has enormous power. And that's without going into detail and that's before you climb into trade lobbying. If there is one exceptional merit to national democracy it is that the simplicity works. If you cannot reasonably explain how a system works then it cannot hope to have legitimacy. It is this fundamental legitimacy that the EU has lacked from inception and cannot hope to resolve without radical structural changes which would make it a fundamentally different animal. The EU is an ideal form of government if you want no part in the process and you're content to trust governance to someone else entirely, but the consequence of this is waking up one morning to find it has outlawed your business or banned a product you depend on and you have no means of redress. There is little in the way of an early warning system and by the time we are aware of what's happening, it's already too late. This mode of government reduces the public to the status of livestock where all decisions are essentially economic decisions where welfare is merely factored in the same way a farmer calculates the light levels in a battery shed for maximum productivity. This is where you find a marked difference between leavers and remainers. Remainers tend not to be bothered by things like democracy and self-determination just so long as you don't have to queue in the airport and your holiday phone bill is cheaper. It suits the politically disinterested and the disengaged. It is interesting that much of the rampant europhilia that exists now did not exist until someone threatened to take their toys away. Meanwhile the people who think that laws and lawmaking should be directly accountable and reformable are Brexiters. EU governance has suited the Blair era down to a tee where the EU takes care of technical and trade governance while the national government manages the redistribution and keeps the plebs adequately serviced by a vast machine employing millions of Labour voting middle class non jobbers. The ultimate in technocratic serfdom, keeping the people dumb but fed well enough so they don't rebel. This is essentially why explaining democracy and self-determination to a neo-Blairite remainer is like trying to explain a waterproof coat to a fish. It has no use for it, no need of it, and the notion that people should have a say in their own affairs is conceptually alien to them. They are only interested in politics so far as it keeps the NHS industrial complex running. This is why the two positions are essentially irreconcilable. Remainers want to be spoonfed zombies without any of the responsibility of democratic participation. That is perhaps a little unkind to some. 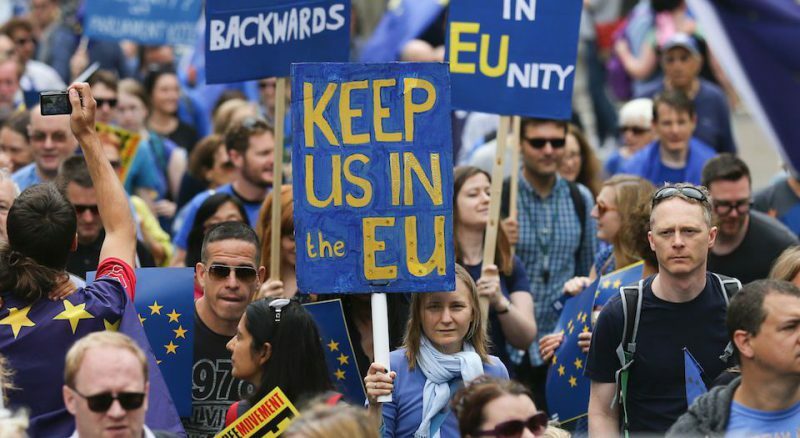 There are indeed some genuine remainers suckered in by the EU's pastiche of democracy but even then, their concern is not Brexit per se, rather the enormous mess we will make of leaving. My question to them though is what on earth did you expect? We have over forty years dismantled most of our independent regulatory apparatus, wound down our consular presence, shut down all our trade negotiation capacity, consolidated all of our external relations into one treaty construct and made our systems hopelessly dependent on the EU. It is not remotely surprised that ministers have no idea how anything works because they are not responsible for running any of it. If there were to be an honest referendum to settle the issue for good it would ask of the public whether they wish to remain and dismantle Westminster as a national apparatus of government - because the levers of power in London increasingly are not attached to anything. It is but a redundant signal box. This would suit the remainers down to the ground. They don't like or trust the voters much and they actually prefer the idea on a constrained parliament and meaningless votes. If we were going to simply exist under EU dominion then we might as well be done with it and stop wasting money on useless MPs. It is actually ironic to me that though I notionally have the right to go and live and work in twenty seven other countries, I cannot think of anything more likely to make me move away from the UK than if we were simply resign ourselves to bland managerial rule. I am well aware that we are no longer an empire. I don't need a gloaty pissant remainer to tell me the Commonwealth is a defunct entity. I thought CANZUK was a ridiculous idea before remainers were even introduced to it. Never once have I subscribed to to any of the theories of the crackpot Eurosceptics. I'm just not of the view that Britain is a deadbeat country that needs to atone for its sins by shutting down its essential democratic functions. There is no reason why we cannot secure a role as a mid ranking power in an intergovernmental setting able to decide who and what comes into our country and on what terms. Here I cannot be persuaded that Brexit makes us any less relevant than we already are in international affairs. The notion that the EU amplifies our influence is a narcissistic delusion. The EU running its own independent agenda as a rogue actor is something we can hide behind but it is not influence in its own right. I rather think it necessary to step out from under those delusions not least so we don't fool ourselves into more vanity bombing campaigns. If anyone has imperial delusions it is the remainers who see the EU as a surrogate empire through which we get to tell the rest of the world what to do. The notion that we live in a post-sovereignty age is only partially true. It is overstated with the intent of demoralising Brexiters. There is give and take on standards and trade-offs in terms of technical governance where there is every advantage in cooperation. Nowhere though, except in the EU, does it say we have to subordinate our values and surrender political authority. And that is the crux of it. All political authority must stem from the people in order for there to be a democracy. As much as we were taken this far in without consent or consultation the people can instruct our politicians but they are bound by the obligations they made to Brussels thus are loyal to Brussels rather than the people they nominally serve. For decades now the British liberal elites (for want of a better phrase) have been in thrall to a self-loathing and a belief that our democracy should be constrained because our values are too primitive and too savage - and that nationalism is the root of all evil. It is that singular dysfunction that has driven them to cleave massive chunks of political power from the people and give it to the unelected and the unaccountable. In so doing they declared war on democracy. The legacy remain campaign is just their Operation Clausewitz. Soon though, Soubry, Adonis and Professor Grayling will be reaching for the cyanide capsules. The game is most definitely up!